A custom designed machine developed for the automatic production of medium size aluminum road signs. 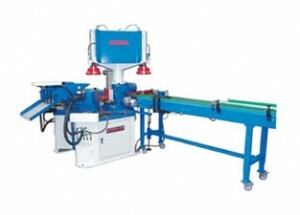 The machine carries out 2 operations, vertical bending and inward flanging by means of servo driven slides. The blank and finished parts are also loaded/ unloaded by means of servo drives. The machine is equipped with CNC controls that enable the loading of CAD files which are translated into the machine program automatically. The machine sets all the required parameters to make the parts. The reduction in set up time, overall efficiency and less complicated tooling (no need for copying cams) helps this machine pay for itself. In addition to the standard manual load machines, Omera and SWH Precision offer automatic loading by servo drives or robots. In many instances the machine is utilized in a work cell where the semi-finished parts arrive by conveyor, are loaded and unloaded automatically. 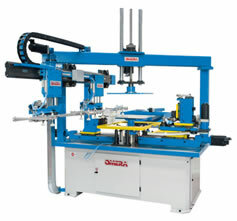 The Omera line of products fully supports this automation. Fully customized solutions are available from Omera that start from a coil to and end in a finished product and include everything in between. Please see the additional offerings (presses) from Omera for more details or simply contact us today for more information.